Dashboard cameras or dash cams are becoming increasingly popular with British motorists. 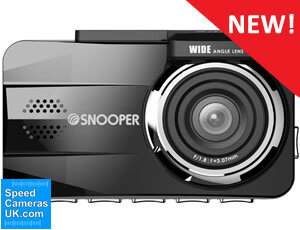 SpeedCamerasUK.com stocks the latest in-car cameras which is the Snooper DVR-5HD. Buy your in-car dashboard camera from SpeedCamerasUK.com. We provide you with the complete selection of accident cameras for use in the UK. Some have also been designed to be used abroad too. Once you've found the dash cam that you'd like to purchase you can either buy online using a debit/credit card or via PayPal. We use SagePay to process our online payments who are PCI DSS Level 1 compliant, so you have total peace of mind with your personal and payment details. Alternatively, if you'd like to place your order over the telephone please call 01733 777623 (Monday to Friday - 9:30am to 5:00pm). At SpeedCamerasUK.com we offer FREE UK delivery on all orders over £50, plus various premium options including working next day at £9.99. Delivery outside the UK costs £14.99 within Europe and up to £29.99 for the rest of the World. For more information please see delivery information. If you are unsure which in-car camera to buy we have a buyers guide that provides guidance and also includes recommendations for the best in-car camera for your needs. Systems like the Road Angel Halo and Snooper DVR-5HD all record in HD quality. You can also watch the video on a computer to review your journey and events that have occurred. With the Snooper DVR-5HD you can also playback the recorded video on the device itself. The advantage of a screen on the device is that you can use it to show offending motorists at the roadside who was in error. If you buy a car camera without a screen you cannot prove anything at the roadside; you will have to wait until you can review the footage at home for insurance purposes. If you are looking for a discrete installation then the Road Angel Halo offers small front and rear recording cameras. The Snooper DVR 5HD is a larger device because it includes a screen too. To read more about cheaper car insurance when installing an in-car camera click here.